Zombie Warrior Man is a Platform, Action, Slasher and Zombie video game, which takes place in the world of the normal human beings, but with a slight difference since the humans discovered a Zombie Warrior Man. This unique guy has no name, and the only thing that humans know is his strange genre, which makes him look and act like a zombie. Zombie Warrior Man is now trapped in a hospital, where doctors are trying to copy his genre. However, he does not like it so he tries to find a way to escape. The game gives you a chainsaw at the beginning, which is considered as your starting weapon. The game’s main stage takes place in the hospital’s hall, where many doctors, nurses and even patients are walking around. Zombie Warrior Man will have to try whatever method that helps him get out of the hospital. You cannot walk through a person or an item without using your weapon to scarify it. 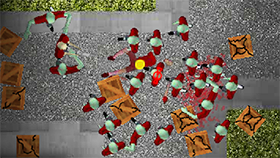 Zombie Warrior Man contains blood and gore scenes, so you will need to consider before you play it. If you are okay with the violence the game contains, go ahead and play Zombie Warrior Man now! Press the four arrow keys to move your character. Press the space bar to use the chainsaw or shoot the gun. You need to consider modifying the quality of the graphics until your computer runs smoothly. You have to cut the target completely in half if you want to walk through it. As you may know, Zombie Warrior Man Unblocked is now featured at Freegames66.com. For your information, Freegames66.com is a game website that everyone has been talking about lately since it provides the gamers with whatever video game that they love. Even more, the site lets the player enjoys any game they want at anytime and anywhere. Have fun with Freegames66.com now!